ART 8 : A place for consumers fond of good meat, but not only. Jason Cottin and Manon Pertuisot have less than 50 years between them. A youth that could have frightened some people before setting up “their business”, but not for these 2 young restaurant owners installed since June in the Port Camille Rayon. Nothing seems to scare them, especially hard work. The young couple that recently arrived in the Port of Golf Juan wants to please the epicureans with innovative ideas. So the first question that comes to mind is why “Art 8”? “Happy Days” in Agay. It’s also on the beaches of the east of the Var that he met Manon who worked in the same restaurant. As his partner is working in the kitchen, Jason plays the spokesperson of the duo after setting up tables. He naturally starts with the professional experience of his girlfriend. “She has several qualifications including caterer and events’ planner. She worked during several seasons including one in Saint Raphael where she started as kitchen help to end up as Chef” he says proudly. For his part, Jason grew up among the tables and chairs of the family restaurant in Limoges. After obtaining his waiter certificate, he started seasonal work until this job in Agay. During 5 years, Manon and Jason worked and learned a lot. They wanted to pool their experience and energy to “set up their business”. Today, they don’t regret this decision, despite the difficulties they had to go through “We did not ask too many questions, neither about our young age nor about the risk that we could fail. We only had to face negative replies from the banks as they did not want to support our project”. This obstacle did not discourage the 2 future restaurateurs. At first, with their defined budget, they were looking for a commercial space in Nice. “We were looking for a location in a frequented area” says Jason. After many fruitless visits they end up looking in Juan les pins and, following the estate agent advice they visit a vacant space on the Port Camille RAYON. They have a crush for the place! “It’s exactly what we were looking for, a human-sized space, since it’s only the two of us working. Moreover, we love boats and we are thrilled to work in such an attractive port” continues Jason. Once the deal is completed, thanks to the financial support from a brewer, Jason started then to work in his future restaurant as decorator/ handyman. 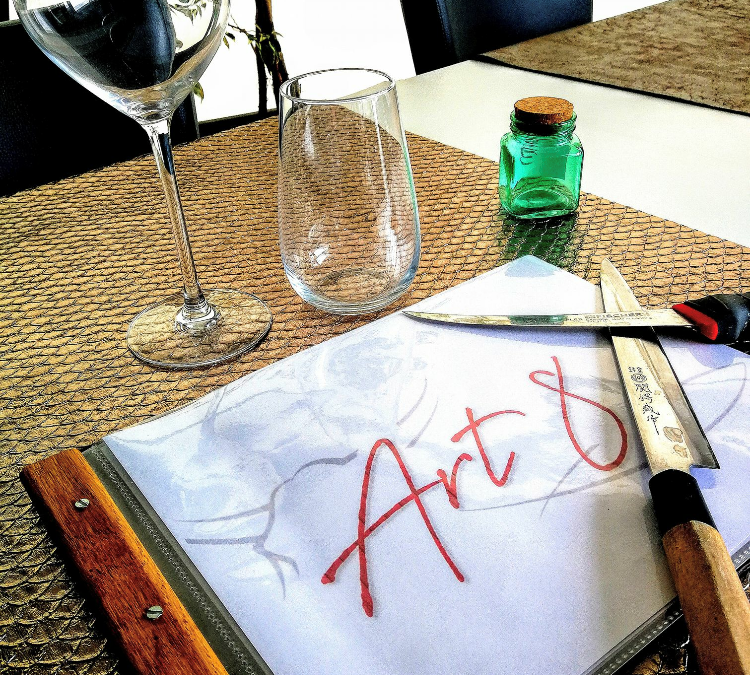 The opening of ART 8 was the 2nd of June 2018, just before the summer season and it went pretty well! For many good reasons “we offer exclusively a meat from Limousin breed kept in a storage cellar. I process this quality meat myself and I sell it at a reasonable price. Manon prefers fish, and freshly cooks her products. The sign of quality quickly is spread by word of mouth as 80 % of the clientele is local; but also thanks to the buzz on TripAdvisor. Offering a lunch menu with 6 possible choices, ART 8 did not take long to win the heart of its customers.